The fall movie season is barely one week old, and it already has one budding hit. Can it keep that trend up this week and show up that no-good, slacker, stuck-up summer movie season? If you didn't recognize the two leads of Just Like Heaven, you might be forgiven for thinking the film is a relic from mid-'80s, when such classics as Date With an Angel and about a dozen body-switch films came out. A romantic comedy between a lonely architect and a ghost who doesn't know she's dead, Just Like Heaven asks for about five levels of suspension of disbelief. It's the kind of wacky misunderstanding we can all relate to. Reese Witherspoon plays the ghost, a former overworked medical student who dies after a 24-hour shift leaves her sleepy and causes her to run head-on into a semi. 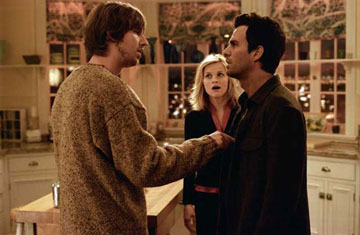 Mark Ruffalo plays the man who rents out her former apartment. Not quite ready to pass on to the next world, Witherspoon's ghost regards Ruffalo as an interloper, although he's probably the most human interaction she's had in years. For reasons yet to be determined, only he can see and hear her, and oh, the wackiness that ensues. See, it's funny when he talks to the air and people misunderstand him. Witherspoon's star has bounced around in recent years, from the highs of Legally Blonde and Sweet Home Alabama to the lows of Vanity Fair and... Legally Blonde 2. Although Witherspoon is one of the many contenders in the battle to be the next Julia Roberts, high-concept and - quite frankly - embarrassing-looking films like this probably aren't the best way to go about getting to that point. However, despite all that, this films is tracking decently, especially among females, who eat this crap up with a spoon. That's right, you heard me. It also has an ace up its sleeve in one Jon Heder, star of last year's indie hit Napoleon Dynamite. Personally, I think the film was wildly overrated, but its cult following is undeniable and his presence will probably add a couple of bucks to the box office totals. Ruffalo is sort of a non-factor here, although he is by a pretty large margin the best actor in the film. He'll get his cash and move on to an indie film that challenges him a little more; either that or find a sequel to 13 Going on 30. The widest opening film of this week, DreamWorks has a fair amount of confidence in this film, pressing heavily with an interesting strategy of buying every minute of television ad time for the first two weeks of September. Maybe it just seemed that way. Leaning heavier towards the romance angle than the other rom-coms out there in the market right now, Just Like Heaven finds itself with a marketplace pretty much to itself. It looks poised to make a decent splash and take top spot at the box office with about $21 million this weekend. Lord of War is one of two Nicolas Cage releases in the next two months, although if you'd only seen the posters for the two films, you could be forgiven for mistaking them for each other as both feature a forlorn Cage staring into the foreground. Just so there's no confusion, this is the one where he's international gunrunner indirectly responsible for the deaths of thousands, and not the one where he's a weatherman in a major American market. Just, you know, in case you were going to see both. Anyhow, Lord of War is a film that promises a look at the world arms trade, with Cage playing Yuti Orlov, a Ukrainian immigrant who has found his way to the top of the industry but also finds that years in this violent business have taken their toll, not just physically but on his psyche, with the bodies weighing heavily on his conscience. All these wars around the world don't just arm themselves, you know. The film takes an anti-war stance (natch), with the potential to be an unflinching, socially illuminating film, in the manner of Catch-22 and Three Kings. That kind of film isn't always an easy sell, as two hours of moralizing is often difficult to take. However, Three Kings was a minor hit in the fall of 1999, opening to $15 million in the time just before George Clooney became a Big Damn Movie Star. That seems to be about the appetite people will have for a similar film from Cage, who's currently in a bit of an upswing from the surprise action-adventure hit National Treasure. Look for Lord of War to bring in about $14 million this weekend on its 2,814 screens. Three other movies debut or expand significantly, but none are likely to be too significant at the box office. However, one is notable for cast and crew reasons. An Unfinished Life boasts a cast of Robert Redford, Jennifer Lopez, Morgan Freeman and Josh Lucas (trying very hard to forget this summer's Stealth) and was directed by Lasse Halstrom, twice nominated for Best Director. It snuck in last weekend to 16th place at the box office on only 139 screens, and this weekend expands to around 750. This should push into about the $2 million mark for this weekend. A couple of generic horror films make up the other two new entries. Cry_Wolf (hate that title) has sort of a Candyman concept, with a group of teens inventing a serial killer that somehow comes to life to haunt them. Featuring the usual cast of young actors that would work cheap and filled out by a couple of names people will recognize (Gary Cole, Jon Bon Jovi(!) and Jared Padalecki), this is yet another film that is prepping itself for its far more lucrative run on DVD. Opening on a surprising 1,790 screens bur receiving little promotion, this looks to be "good" for about $3 million this weekend. Already a candidate for a dump of a release prior to a couple of weeks ago, Venom became even more of an awkward film in the marketplace after recent events. A zombie film based on a video game that hasn't been released, it is one of the last films in the Miramax arsenal that must be released as part of the deal with the Weinsteins. It also is set in the bayou of Louisiana, which you might notice has been in the news a lot lately. A 489 screen release is almost the definition of a token opening, and I wouldn't expect this to even break the top 20 of the box office. The market's horror fix was already satisfied anyway, with last week's number one, The Exorcism of Emily Rose. That film surprised most pundits by shooting out to $30 million, almost four times its next challenger. Extremely well-marketed, the low budget scare-flick will easily be one of the most profitable films of the fall. Although its word-of-mouth has been decent, I don't see this one maintaining an audience beyond one week, and it should drop to around $16 million. Late summer holdovers continue to make noise at the box office, with The 40 Year-Old Virgin closing in on the $100 million mark and Wedding Crashers set to become the third-highest grossing film of the summer sometime in the next month. That said, most movies left in the top ten are simply playing out the string, and are set to be replaced very shortly as fall films continue to roll out.